The key is in finding two different materials that will create a charge imbalance when put together and separated (usually by rubbing). We also have to consider durability, degree of charge imbalance created, and the sensitivity of the material to weather variations (temperature and humidity). Even slightly sweaty hands can be an issue for fabrics. A fabric section should be mounted on a foam block, foam cup, or other moisture blocking objects. The surfaces to be rubbed should be handled as little as possible to limit the transfer of hand oil, dirt, or other contaminants to the material. Manufacturing differences and additives can make one item (a foam plate, for example) work well while an apparently identical item from the same distributor or a different manufacturer may not work. Caution: Some students may be allergic to wool! Cut the rectangle foam plate in half. Take the pre-cut piece of silk cloth and place it on top of the blue leaf-shaped soft foam block and secure with the rubber band. Briskly rub the covered foam block and plate bottom together. For some brands of the foam plate, one side may work better than the other in generating a charge imbalance. Try both sides. Now try again with the stiff black foam block. 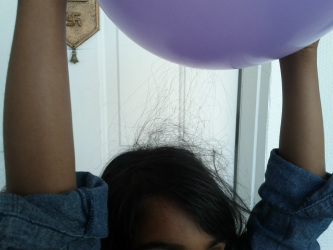 Which one of the two foam items produce the most static electricity? Repeat step 1 as needed to "recharge" the surfaces for the activity. Grind large fresh pepper flakes into a plate or bowl. Briskly rub the silk cloth over the foam plate for about 15 seconds. Without touching the pepper flakes, bring the silk-covered foam block near and observe what happens. Joining objects together and then separating them can move electrons from one item to the other. Objects differ in how strongly they "hold on" to electrons. An object that gains electrons will have a negative (-) charge. An object that loses electrons will have a positive (+) charge. Electrons are moved, not created! This is sometimes referred to as "triboelectric charging", creating a "charge separation", a "charge imbalance", "charge" or "charging" a material. For solid materials the positive charges (protons) cannot leave or really move about within and between materials as electrons can sometimes do. by each other. The force of attraction and repelling increases with a decrease in the distance between the charges. The charges will, in a sense, "stay put" unless the item is a conductor (metal, etc.) that has electrons that move about very easily. If you generate enough static electricity, the pepper flakes are attracted and jump onto the silk cloth!! Now try this with other herbs or iron filings. Lightly scrape the surface of the foam plate to increase the charge generation. Unseen dirt, finger oils, etc. can greatly reduce the charge that a previously useable pair of items can generate. Use a new pair of items as some contaminants can spread to other materials when rubbed. 1. Experiment with other pairs of materials. How can a charge be eliminated from a surface?